After attending OPEN Health’s inaugural ‘Health Innovation: Big Ideas’ event in London, Paul Tunnah outlines some of the concepts that could be game changers for the pharma industry and the broader future of healthcare. I’ll try and get all the buzzwords out of the way in the first paragraph, when I tell you that the ‘Health Innovation: Big Ideas’ event held by OPEN Health on 23 June was focused on advances in healthcare being delivered by digital, big data and novel technology. But to its credit, this was far from being just another ‘beyond the pill’ event, with a focus on the much broader landscape of managing wellness. In fact for much of it, the pill was barely in sight at all. Led by OPEN Health’s David Rowley, the evening featured four expert speakers, each focussing on a different ‘big idea’ with relevance to pharma. Lord Sebastian Coe (he had something to do with the Olympics in case you’ve forgotten) presented the keynote on smart disease prevention, with Kingsley Manning (HSCIC) then discussing big data, and specifically the care.data initiative, before Alex Butler (The Earthworks) presented a vision of the digital future for healthcare, concluding with Dr Bina Rawal (ABPI) bringing it all back to pharma. While these may seem like disparate topics, there were common threads among them, which highlight significant opportunities for those within pharma who are forward-looking enough to grasp them. Following the success of London 2012, Lord Coe was appointed as an ambassador for Nike’s ‘Designed to Move’ initiative, which aims to tackle the current ‘epidemic’ of inactivity and its consequent impact on health. He presented some sobering facts, quoting that as children grow up, the average 9-15-year-old gets 50 per cent less active, with global levels of inactivity leading to an unsustainable burden on healthcare. A glance at the initiative’s website reveals some further statistics that highlight the scale of the problem. In the US, China, India and UK the cost of physical inactivity in 2008 was estimated to be $200bn; a figure which is rising fast. As a result, today’s 10-year-olds could be the first generation to have a lower life expectancy than their parents. Lord Coe believes any solution has to start early, building and sustaining physical activity into the daily lives of young children, with support from commercial partners. We need it to become as ingrained as the ‘five-a-day’ rule around fruit and vegetable intake in our diets, he feels. But getting the message across is not easy and one key thing he learned from the Olympics was the power of social media to reach young people. Perversely enough, as one observer pointed out, social media may be the tool to get the message across, but it also keeps us sitting on our sofas reading tweets, rather than out taking a walk! But there is a salient point that education can be supported by technology, which is something that Butler covered in more detail. As he often point outs, technology only becomes really useful once it’s become a bit boring, so as we start to tire of hearing about the quantified self, wearable technology and mobile health, we may start to really discover what it can do. Indeed, new digital devices can now do far more than tell us how many steps we have taken each day. Personal diagnostic tools are emerging that can identify signs of, and risk factors for, disease onset way before it becomes symptomatic, either through genetic profiling or monitoring of bodily function, such as internal microbe activity. The potential combined impact of healthier lifestyles and pre-symptomatic disease management and prevention could be enormous, so pharma must take note. Kingsley Manning discussed some of the opportunities and challenges of using healthcare big data. As Chair of the Health and Social Care Information Centre (HSCIC), he has the role of leading the UK’s efforts to collect, analyse and present national health and social care data, which includes the recently launched care.data initiative. The numbers surrounding some of the data processed by the HSCIC certainly reinforce the ‘big’ tag, with 29 billion data requests being processed every month through NHS Choices. And the potential for such big data to drive better healthcare is significant, where it could underpin a shift towards more personalised, or stratified, medicine. To get there, Manning feels that data sharing must become as commonplace as the use of vaccines, but there are significant obstacles standing in the way of that, not least of which is the ‘exciting’ (Manning’s choice of word) initial response to care.data in the mainstream media, driven by a debate over whether use of a patient’s data in this way should be ‘opt-in’ or ‘opt-out’. The general undermining of trust in public institutions over the last few decades has not seeded the ground well for such open data sharing, in his view, and potentially new EU legislation on data privacy could make it even harder. A number of issues must be tackled head-on to make healthcare big data really useful in the UK, including questions around ownership, transparency of use, anonymisation (plus security and traceability) and consent. And while the HSCIC is grappling with this issue, commercial organisations are also making strides into this space, with some even offering to buy people’s health data, which could impact care.data if it cannot move quickly enough. Looking beyond the issues outlined above, as this big healthcare data is unlocked, it will impact both prevention and treatment of disease. Real-world evidence (RWE) could potentially usurp clinical trial data as the key driver of drug licensing/use and forward-looking organisations are planning for this. One such example quoted by Butler was US-company Flatiron Health, which has developed a cloud-based repository of RWE data for oncology patients, currently being tested by a number of cancer treatment centres as a tool for delivery of more personalised treatment. As Dr Bina Rawal highlighted how the UK punches above its weight in the pharma sector, one key point dovetailed with Manning’s and Butler’s presentations very neatly – a clear recognition by the ABPI of the importance of investment in better data and diagnostics for personalised medicine; an area she views as the future of pharma. I have highlighted previously the risks for the pharma industry of getting left behind in such a fast-changing environment, but the reality is that all of these big ideas ideally need engagement and partnership with pharma to succeed. Lord Coe stressed that he would welcome pharma’s input into ‘Designed to Move’, describing it as a ‘no-brainer’ for the industry to get involved and bring its disease and commercial expertise to bear on managing wellness. Manning highlighted how the 3-5 per cent productivity gains needed by the NHS to meet budgets require better use of data and technology, which is something it can only realise with pharma’s help. Butler summarised the opportunity best for those pharma companies who can step forward to embrace this change. Technology giants like Apple, Google and Samsung are aggressively moving into mobile health, but they don’t have the medical heritage of big pharma and partnership could deliver success for everyone much more quickly. The industry is recognising the coming change, but Butler rightly pointed out that putting patients first has to be more than a mantra – healthcare systems must be designed around the patient for success. Accordingly, pharma must move beyond its current focus on treating illness and focus more on managing wellness to maintain as important a seat at the healthcare table. These big ideas have the potential to revolutionise healthcare, but they can realise that potential much more quickly with big pharma’s help. Tweets from this event can be reviewed on Storify here. 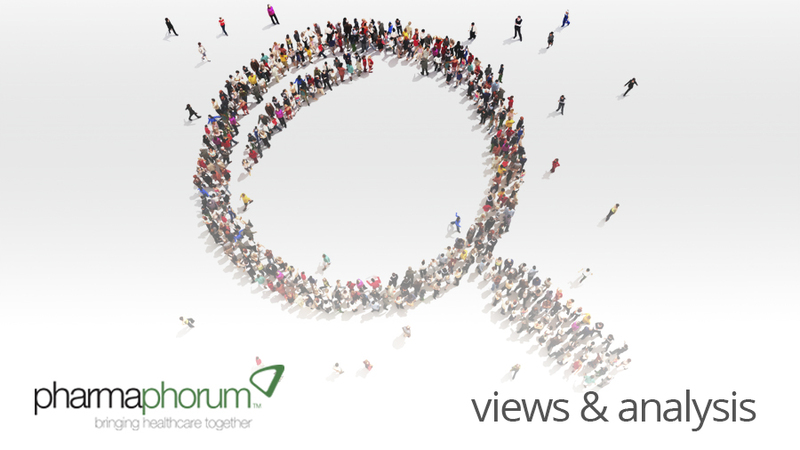 Have your say: What is pharma’s role in driving healthcare big ideas?